(Bloomberg) -- For the last six years, Kevin Bowen has made good money selling sand to shale frackers who use it for drilling. It was hard not to. The industry has been booming in the oil fields of West Texas. 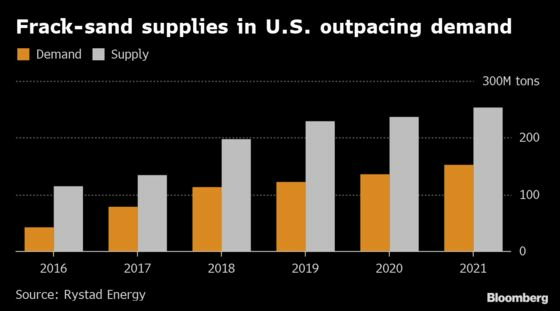 But today the U.S. frack-sand industry is swimming in an excess of supply that has battered prices and cut the stocks of frack sand miners by more than 70 percent in the last two years. So Bowen’s Shale Support LLC, based in Mississippi, is doing something he thought would never happen: selling sand outside of the U.S. -- and reaping a 20 percent bump in profit. The first shipment, 25,000 tons worth, pulled into a port in Bahia Blanca, Argentina last month after a 22-day sea odyssey from New Orleans, and he’s still amazed that Argentina would look past its own sand. The source of the oversupply is easy to trace. In the last couple of years, entrepreneurs opened dozens of sand mines throughout the U.S., particularly in the red-hot Permian Basin oil patch of West Texas and New Mexico, rivaling the original capital of U.S. frack-sand mining in northwestern Wisconsin. Production surged 50 percent. Now, for every grain of sand that explorers need to prop open a tiny crack in their oil-soaked rock, miners have roughly two grains to offer them.